Andy Atkins, his wife Jenny and their four-year-old son Logan miraculously escaped unscathed after their plane plunged into the sea – and doctors passing by in a boat jumped in to save them. The Texas family was on a sightseeing flight along the coast of Roatan, off Honduras, when the plane’s engine cut out and the craft plummeted into the sea. There was panic as the plane was sucked under the surface, with Andy Atkins and the pilot desperately scrambling to save his wife and child. “I dove back under looking for them, came back, got air, went immediately back down,” Andy Atkins, an attorney from Dallas, told NBCDFW.com. But he added: “We were all still in shock at that point. 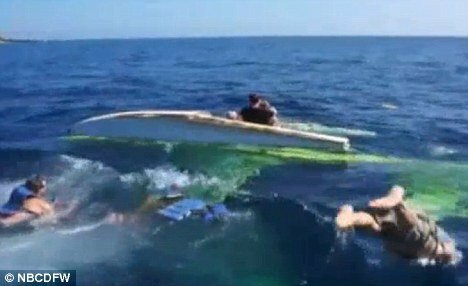 Miraculously, a boat happened to be passing and several people jumped into the water to save them. Several people on a nearby boat jumped in to save them. Among the divers were a U.S. Navy doctor and another physician who immediately started treating Jenny Atkins and the boy, NBCDPW reported. “They screamed that there’s two doctors on board,” Andy Atkins said. The family members were later treated at hospital. The Atkins family is planning another trip to Roatan this summer – and said the accident brought them closer to the island and the people there. ”It reaffirms your faith in people and humanity that so many people stepped in to help that didn’t have to,” Andy Atkins said.